Now that Spring is here and we've said goodbye to that harsh Winter we had, it's now time to make sure that our skin is feeling refreshed and hydrated in time for Summer. I don't know about you, but the Winter did a number on my skin, even when putting on my daily lotions. I'm so glad Spring is here. I was recently sent all three of Vaseline's Spray and Go Moisturizer. They come in three different scents, Original, Aloe Fresh and Cocoa Radiant. What I loved most about using these Spray and Go lotions was that they didn't leave me feeling greasy or sticky and left my skin feeling soft, hydrated and fresh looking. Another thing I love about these spray and go moisturizers is that they definitely come in handy when you're trying to save time. Instead of pumping out lotion on my hand to apply to my body, using the spray and go lotions directly on my skin saved a lot of time, especially on those days when I'm in a hurry. The spray's dispenses the lotions evenly all over your body, so all you have to do is spray, rub in and be on your way. A couple of weeks ago when we had one of those really warm and humid days out, my daughter's skin got really dry and needed some type of moisturizer on quick that would help re-hydrate it and using the Spray and Go Aloe Fresh worked great. The spray not only absorbed within a few seconds, it also had her skin looking and feeling hydrated. I've been having both the kids use these sprays after bath time and in the morning so they're skin is completely moistened. 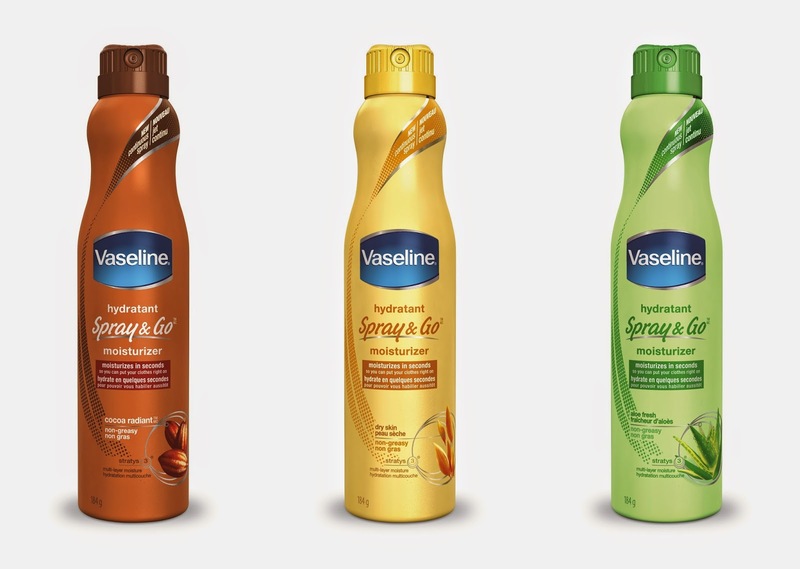 If you're looking for a quick on the go moisturizer that isn't too heavy and works quickly be sure to check out Vaseline's Spray & Go. They can be found at retails for around $6.99-$8.99 a bottle. If you want to give some other Spray & Go products a try check out our review for the St. Ives' Hydration Spray Lotion and Vaseline's Men 24 Hour Spray Lotion, all products from Unilever.